Given its status as the original blockchain protocol, it should be no surprise that bitcoin has long dominated the digital currency markets. In terms of market capitalization, it dwarfs other cryptocurrencies. Its first-mover status and widespread adoption has (so far) given bitcoin the dual advantage of network effect and steep barriers to entry, keeping alternatives at bay. But there’s evidence that this longstanding narrative could be changing. Recent infighting in bitcoin’s development community has provided a rare chance for alternatives to stress their value propositions and even assert new ones (like being a hedge in times where bitcoin’s future seems uncertain). This has led to an interesting, observable trend. While the total pie of the cryptocurrency market keeps growing larger, bitcoin’s slice is becoming smaller. The clearest illustration of bitcoin’s network effect is the ratio of bitcoin’s market compared to the market cap of all other digital currencies. 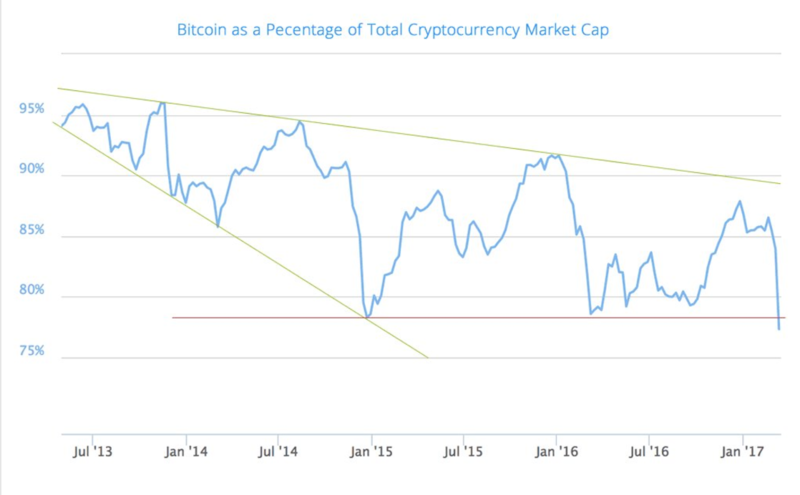 The most authoritative source for this data is CoinMarketCap.com, which publishes its ‘Bitcoin Dominance Index’. Its current value of 72% illustrates that bitcoin has its lowest percentage of market share since it started publishing statistics in April 2013. This analysis is by no means concrete, as bitcoin’s share has dipped in times of stress before. The question now, however, is what make of the downtrend. As the chart above shows, bitcoin has seen a number of sharp periods of decline followed by reversions to the mean. But the data illustrates that the market may be trending against ‘bitcoin maximalism’, or the idea bitcoin will be the only dominant blockchain in the future. Yet, it may not be fair to suggest that bitcoin’s declining market share represents competition against its value proposition. Yet, a major difference between previous declines and now is the relative strength of other alternative protocols. None may be more notable than ethereum, and its blockchain asset, ether, which has been setting new all-time highs in recent trading sessions. This surge followed the news in late February of a 30-firm partnership called the Enterprise Ethereum Alliance, and nearly two years of open-source development. Unlike many other protocols, ethereum has a clearer value proposition in that it is designed not to be a digital currency, but a platform for decentralized applications based on blockchain. With a market cap nearing $4bn, the ethereum is gaining a more liquid market that is better better suited for trading, and institutional firms are starting to notice. Also notable is the rise of dash. 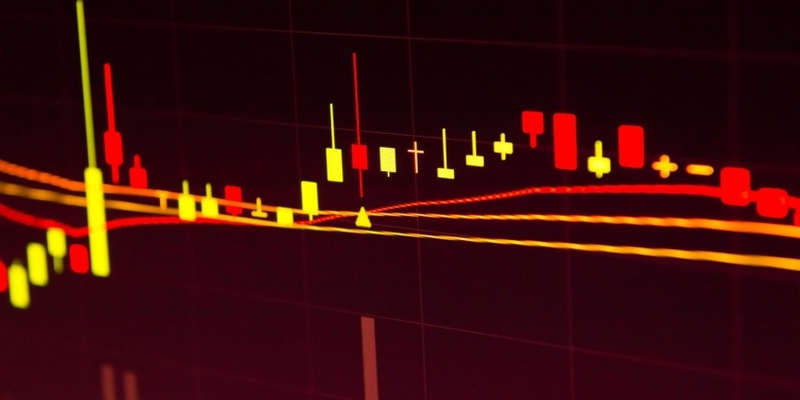 Though analysts have cautioned that they are skeptical about the asset’s increase in value, it has nonetheless gained 200% in less than a month, cementing itself as a solid number three in the list of digital currencies by market value. It is unclear whether this recent bull run is a speculative price bubble or a revaluation based on strong fundamentals, but it could signal the market’s favorable view of a strong governance protocol and a payment protocol which features anonymous transactions. Though the possibility exists of a future not dominated by bitcoin, this shouldn’t be taken as a negative connotation. Due to the fact that new bitcoins are produced daily, the total value of all bitcoin’s has never been higher. While certainly some coins have been lost, burned or otherwise removed from the market, this means that more money has never been invested in bitcoin. But if one thing is for certain, the uncertainty in the market is having an effect, and creating opportunities for change.